Many new brides want to know how to keep their engagement rings “jewellery store clean.” Diamonds get their sparkle from light’s ability to bounce around the facets, but oils from the skin, lotions, and environmental debris can form a film on the diamond and cause it to lose it’s luster. While brides can and should keep their engagement sets hygienic by lightly cleaning them at home, it is a good idea to go to a professional jeweller for regular cleanings of rings. Reason #1: The first reason to choose a professional jeweller to clean an engagement ring is experience. Jewellers know how to clean every nook and cranny without ever damaging the ring. A jeweller’s experience tells him or her the details that do not occur to every customer; for example, a jeweller will know which stones can and cannot go in the ultrasonic cleaning machine, which stones can and cannot tolerate heat from a steam cleaner, and which metals can be polished on a professional polishing wheel. An inexperienced bride may not have the know-how to get the best results or may make a mistake that results in damaging the ring. Reason #2: On that note, the second reason to choose a professional jeweler to clean an engagement ring is that professional jewellers have commercial grade ultrasonic cleaning machines, steamers, and polishing wheels, and many more expensive and precise machines with one purpose: making jewellery look beautiful. Clients can spend a fortune buying DIY jewellery cleaning kits and devices, but none of it will ever match the quality of a high powered machine operated by a professional. The best, most sparkly, most hygienic clean will come from a professional clean. Everyone goes to the dentist once a year for a deep cleaning, even though we all have toothbrushes at home; it’s the same with jewellery, the professionals do it better. Reason #3: The third reason to go to a jeweller to have an engagement ring cleaned is for peace of mind. For most women, an engagement ring is the most expensive piece of jewellery they own with the most sentimental value of anything they own. 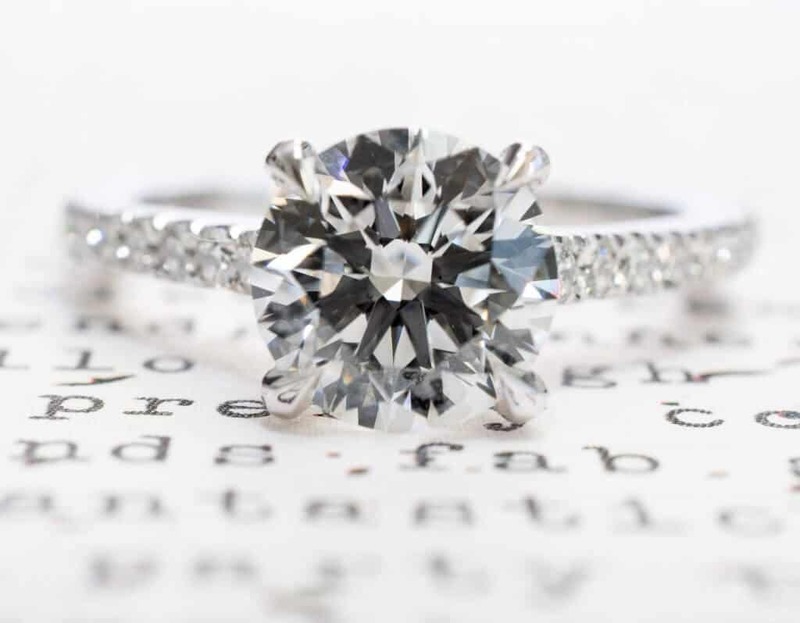 A professional jeweller will perform an inspection each time he or she cleans the engagement ring, notifying the owners of any potential loose prongs, cracked metal, or other hazards that might result in losing a diamond. It is in the interest of preserving a ring’s integrity and the investment in the diamond to have a professional jeweller do a cleaning on a regular basis. Reason #4: The fourth reason to have a jeweller clean your engagement ring is for fun! It is always good to have an excuse to spend a little time in a jewellery store. Not only is it a great way to get to know your local professional and build a trusting relationship with the person who cares for your ring, it is a great way to see new pieces of jewellery, shop for those you love, or even choose that next anniversary gift.